When I sit down to Thanksgiving dinner this Thursday, I know there's going to be a little more butter and cream in the mashed potatoes. The cornbread stuffing will have an extra dose of love (read: bacon fat) and I'll help myself to second servings (maybe thirds) of my mom's famous garlic cheese grits. Admittedly, that's a lot of heavy food. That's why I'm bringing this chiffon cake for dessert. It's light and fluffy, and so fragrant with citrus that it perfumes its surroundings. How do you feel about fresh cranberries? I've been a little wary of their tartness, so I've mostly avoided using them as a garnish. But these! They are delicious because they get a bath in hot sugar syrup and then a toss in sparkling sanding sugar. They are a perfect bite of tart, crunch and sweetness and they crack between your teeth which makes them addictively poppable. I love how they look like sparkling gems on top of this cake. It was fun making them because they are so simple and beautiful. 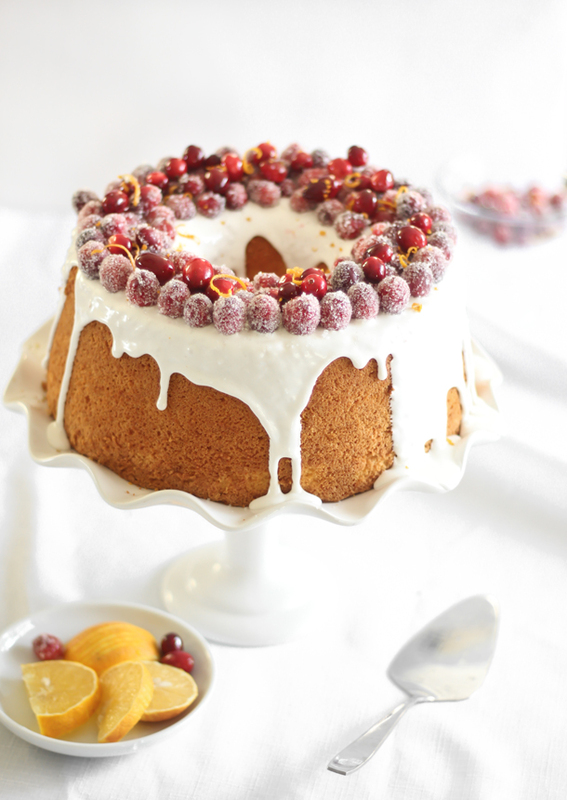 This cake is a nice, light addition to a Thanksgiving feast, but it will also beautiful on a Christmas dessert buffet (those cranberries!). 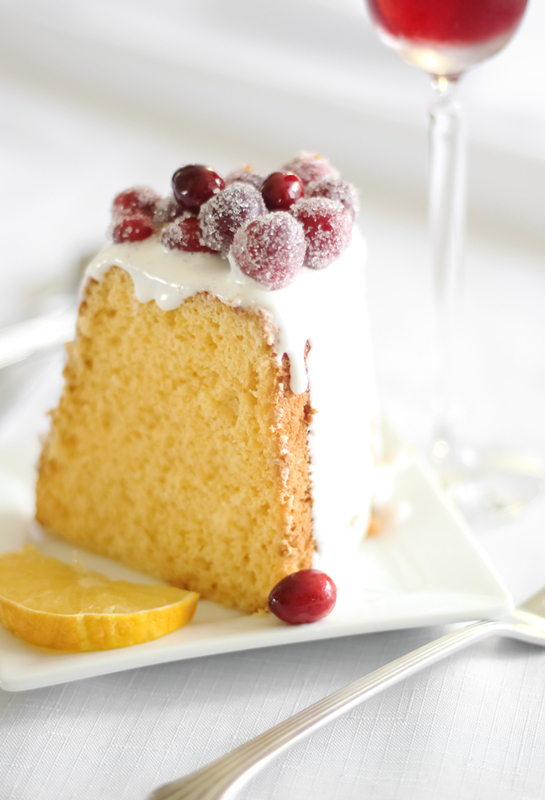 If you've never made a chiffon cake, then you should know that there's quite a bit of egg-whipping involved. 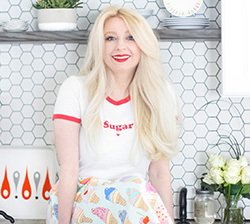 A standing mixer is helpful and preferred for this recipe. I added marshmallow cream to the glaze on this cake, which is a good counter to all the feather-lightness. If marshmallow cream is not available to you, then it may be omitted from the recipe. 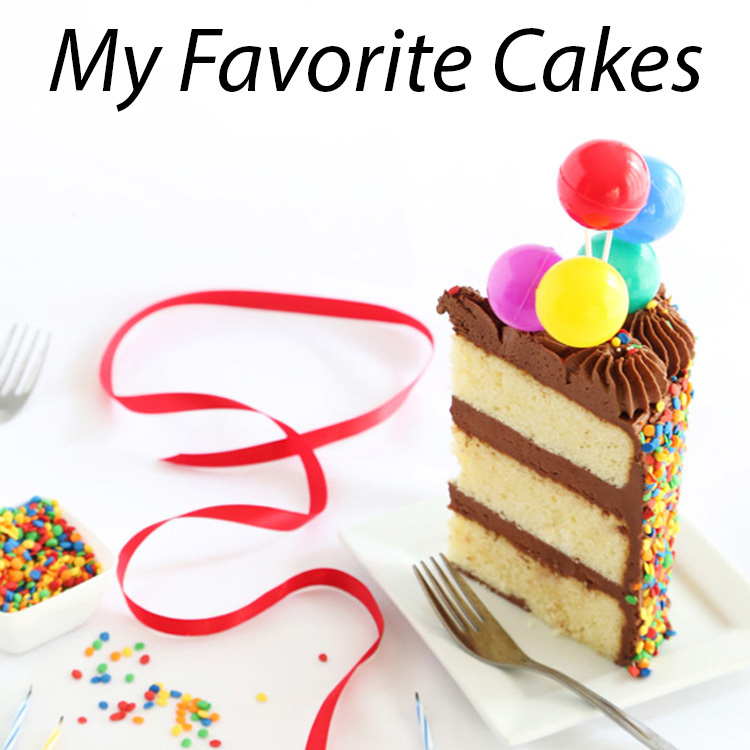 This cake is still lovely with a basic confectioners' glaze. This recipe requires the use of a tube pan. Sift the flour, granulated sugar, baking powder and salt into a large bowl; make a well in the center. In the bowl of a stand mixer, beat the egg yolks until thickened and light yellow in color, about 7 minutes. Beat in the orange juice, oil, water, vanilla, orange extract and orange peel. Pour the wet ingredients into the well of dry ingredients; combine with a large spoon or spatula until well incorporated. In a separate bowl, beat the egg whites on medium speed until foamy. Add the cream of tartar; beat until stiff peaks form. Gradually fold into batter with a large rubber spatula. Transfer the batter to an ungreased 10-inch tube pan. Bake at 325°F for 55 to 60 minutes, or until the cake springs back when lightly touched. Immediately invert cake; cool completely. Loosen the cake from the sides of the pan with a butter knife; remove the cake and place on a serving platter. Let cool completely. For the glaze, combine the confectioners’ sugar and whisk in the milk 1 tablespoon at a time. The mixture will be thick. Stir in the marshmallow cream and extract. Thin the mixture with additional milk, if needed. 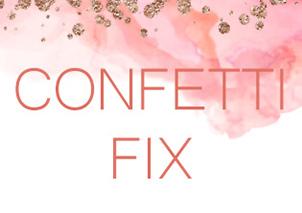 The mixture should be thick enough to fall in a thick ribbon from a spoon. Pour glaze evenly over the top of the cooled cake. For the cranberry garnish, heat the water and granulated sugar in a small saucepan until the sugar is dissolved. Place the fresh cranberries in a shallow dish and pour the sugar syrup over them. Stir them gently, then transfer them to a wire rack placed over a length of parchment. Allow them to dry slightly before rolling them in the sanding sugar. Garnish the top of the cake with the cranberries. Add grated orange peel, if desired. Store cake loosely covered on the counter top or under a glass cloche. This is so beautiful! 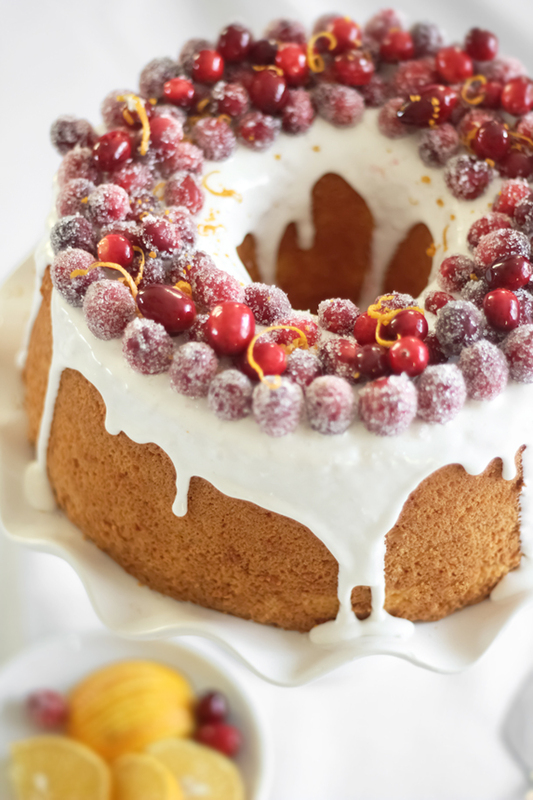 What a wonderful use of cranberries Heather! 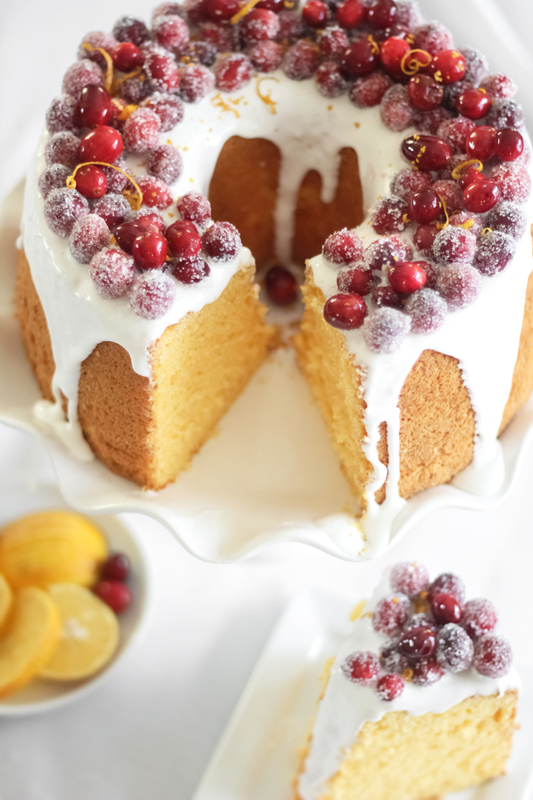 this cake & the cranberries are gorgeous!! love this! would frozen berries work for this after they are thawed? Sounds Delicious! One my list of a scrumptious cake , nice for another Treat for Christmas baking tradition! I made this cake on Sunday. While the cake itself was delicious, the top stuck to the pan (though the instructions specifically said not to grease the pan) so I ended up losing about an inch of cake on top. Any thoughts on what might have happened? Glaze was yummy, and I loved the cranberry technique--though my cranberries fell through the wire rack, they just sort of sat on the parchment. A beautiful cake that got lots of ooh's and ah's. Gosh, so sorry the cake stuck! That's always disappointing. Sounds like it went over well though, so that's good! It's hard to say why it stuck. Perhaps next time line the bottom of the cake pan with parchment, or give it a light spray of flour - based baking spray. I love the latter because it's so easy. Gorgeous! Beautiful and perfect holiday cake! This cake is beautiful! 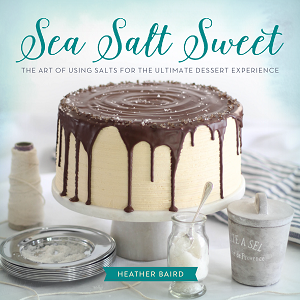 I am going to try to make it this weekend; I couldn't find "sanding sugar", can I use regular granulated sugar? Also, where I live we can only get marshmallow fluff, not cream, will that work in the glaze? Thank you! Hi! Thank you! Regular sugar will work fine, they just won't be quite as sparkly - but still quite pretty and tasty. Marshmallow fluff will absolutely work in the glaze. Best of luck with the cake! Hello! Can I use a bundt pan instead? And what do you think about mixing in some dried cranberries into the batter? I am also curious whether a bundt pan can be used instead of a tube pan. Thanks! Sorry for my delayed response, friends. The holidays are getting the best of me! 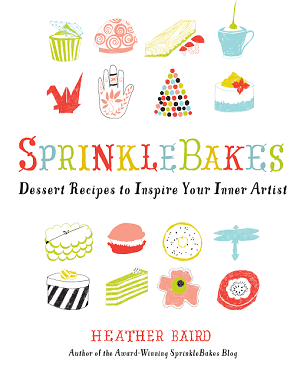 There will be more batter than a standard bundt cake pan can hold. This cake is like an orange angel food cake, so in my opinion it does need to be baked in a tube pan. If you don't mind having excess batter, then you could attempt the cake in a bundt pan, but only fill it 3/4 full. The batter puffs and expands as an angel food cake does. Hello! Me again, I'm the one who asked about the sanding sugar and marshmallow fluff. I am pleased to say that I have made this cake twice this Christmas, and my husband's family and my family both loved it! My brother has requested it for his February birthday (his favorite part was the sugared cranberries, which came out beautiful and sparkly even with regular sugar)! My cakes both settled in a little in the center so they didn't quite stand up as straight as in your pictures, but they were beautiful and delicious anyway! Thank you so much for a great recipe that I will use again and again! Can you eat the cranberries or is that more just for looks? I have only had cranberries when they were cooked down. We ate them! 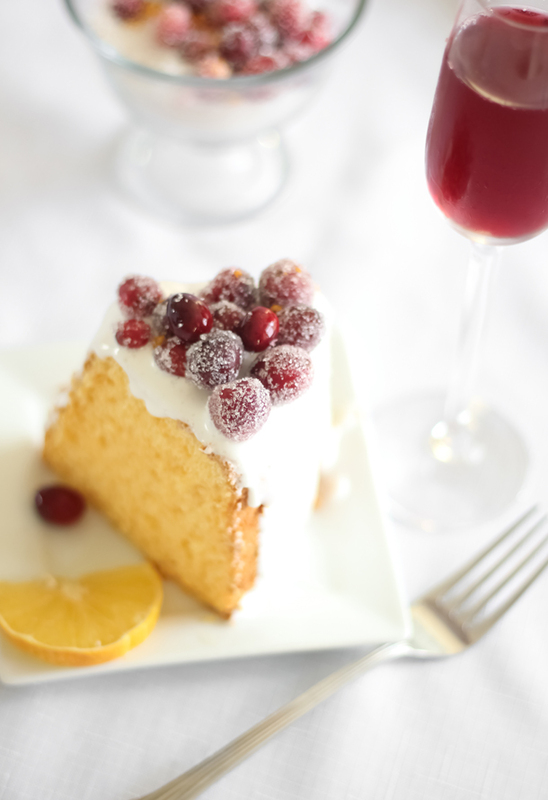 If you're worried about them being too tart, then you may want to make a batch of the sugared cranberries to test before putting them on the cake. They get a bath in sugar syrup, which gives them extra sweetness before they get coated in the sugar. 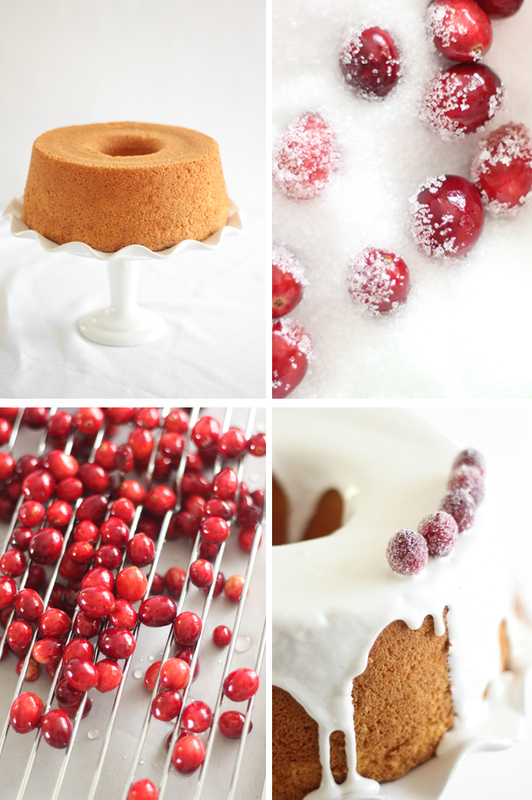 We enjoyed eating the cranberries on the cake and just as a snack. I've made this cake twice and it was a big hit both times. It is so pretty and tastes good, but I would like it to have more of a citrusy flavor. Instead of using a 1/4 cup water, could I increase the orange juice by a 1/4 cup?